I have a subby hubby.Yeah, that means a husband who works in the submarine. A Swedish friend of mine coined that term and it has stuck with me ever since. Even though Angel had the privilege to enter a real submarine in Karlskrona and that we have been to a couple of Navy Open House events, I realise she only knows that Daddy works on a ship. Full stop. 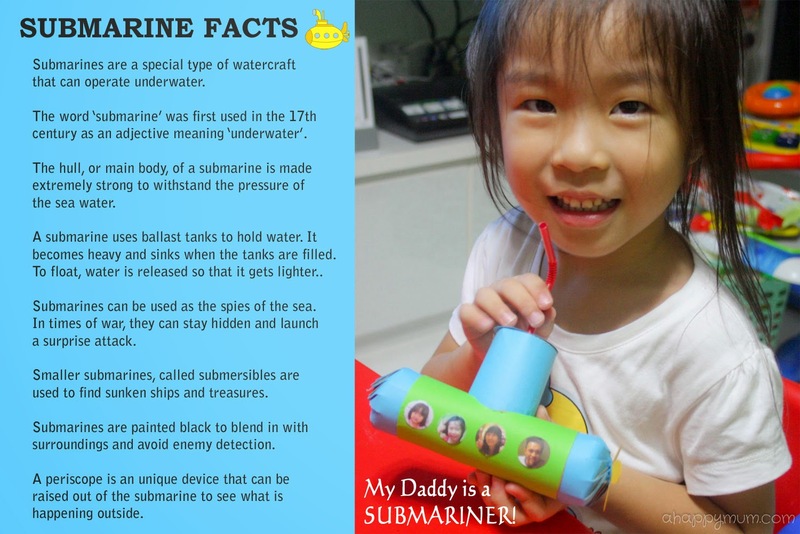 With all the hype about Navy@Vivo and since Father's Day is around the corner, we decided to make a simple craft closely related to Daddy's line of work - a Submarine, of course! Firstly, choose a colour for the body of the submarine. Measure a rectangle to the height of a toilet roll and enough width to wrap around, then draw lines and let your child cut it out. It was the first time I saw Angel using a scissors in the proper way and even if she missed the line by a little at times, it was totally fine. Next, lay the rectangle on the table, place the toilet roll in the middle and trace the outline. Cut out the circle by making a hole in the middle and using a small scissors to cut along the circumference. To make a hole in the body to house the deck, put glue tape at the sides of the rectangle and around the circle. Glue it onto the toilet roll. Using a pen knife or small scissors, cut out a matching circle from the roll. Take the second toilet roll and trim it to three-quarter of its height. Cut out a rectangular piece from a second coloured construction paper and stick it around the roll. This will be the deck for the submarine. Insert it into the hole in the first toilet roll so that they form a T-shape. Moving on, we will make the sides for the submarine with the last toilet roll. Cut it into half, then wrap with construction paper and secure with glue. This was Angel's favourite part and I was pretty amazed that she could wrap and stick the paper around the rolls quite neatly. To make the sides resemble closed tubes, make slits with widths of about 0.8cm and cut them till the midway mark for both the halves. Overlay the flaps one by one and glue them together using hot glue until you achieve the below look. Insert them, one in each end, into the body of the submarine. Note: Please exercise caution with the glue gun and if your child is not old enough to handle the heat, parental assistance is required. To put in a periscope. cut out a piece of paper same sized as the deck opening, poke a small hole in the middle and insert the bendy straw. Use a glue gun along the circumference to secure the circle to the opening. A submarine cannot do without a propeller, right? Cut out a flower shaped propeller from the last piece of construction paper as shown. Use hot glue to secure it onto a small circle and then to one end of the submarine. Lastly, add in pictures of the ship crew (even though there are no windows in the real submarines, this just helps to personalise and jazz things up a little) and we are all done with our simple-looking DIY submarine! The subby hubby had a pleasant surprise when he came home although I bet this looked nothing like the submarine that he works on every day. Nonetheless, it serves as a perfect memento or gift for Father's Day, right? Since we were on the topic of submarines, I wanted Angel to learn more than just putting toilet rolls and papers together. We had a talk, in layman's terms, about submarines and it was the perfect opportunity to teach her about some fun facts so that she could better understand what Daddy does at work. Did you know all these facts about submarines? To the subby hubby and daddy, please know that we are so super duper proud of you! To all daddies in the world, here's wishing you a HAPPY FATHER'S DAY 2014! May you continue to work smart, stay happy and be the hero in your child's eyes. For more ideas on crafts for kids, visit my gallery here. Love the facts you listed for submarines. Yes, we just did a periscope at Esplanade last week. It's funny that we used it to have a better view at the Marina Bay Sands or whatever when we were being blocked by someone or something . LOL...btw, your subby hubby has a real cool job.